Bio ethanol is utter pure alcohol that is also known as Methylated Spiritsin Europe. 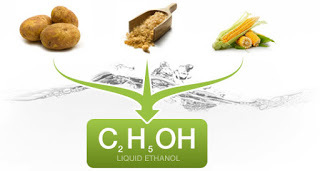 Bio ethanol or plainly "ethanol" is a renewable energy source made by fermenting the sugar and starch components of plant by-products - mainly sugarcane and crops like grain, using yeast. It is also made from corn,potatoes, milk, rice, beetroot and recently grapes, banana and dates depending on the countries agricultural strength. Today, bio ethanol has many uses: It is blended with petrol to make a truly sustainable transport fuel, it's used in cosmetic and other manufacturing processes, and it creates the clean burning, beautiful dancing flame in our fireplaces. Bio ethanol is completely composed of biological products. The combustion of bio ethanol results in a clean emission: Heat, Steam and Carbon Dioxide. 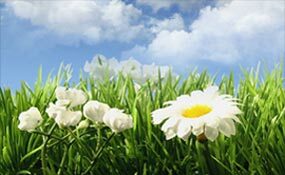 Carbon dioxide is absorbed by plants. It is then processed via photosynthesis to help the plant grow. This infinite cycle of creation and combustion of energy makes bio ethanol a carbon neutral fuel source. Because the combustion of bio ethanol is clean you can lose the chimney and the flue and keep the heat - so most of the heat generated by the combustion of bio ethanol gets to stay in the room - that's what makes burning bio ethanol so efficient and effective. Some fuels are better than others, it’s important to source information on the best fuel in your area. See full selection of ethanol fireplaces fuel. 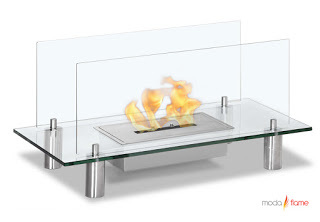 Visit our about ethanol fireplaces page, to learn more about ethanol fireplaces. I have entered a credit card several times...your systems say it is incorrect..said I could contact you , not seeing a number. does anyone have contacts # 's for this company?